When Do They Start To Dance? Why Should You Encourage Dancing? Should I Enroll Them In Dancing Classes? What Can You Do To Encourage Your Child To Dance? I remember the first time I saw my little one dancing. Even when my boy was still a few days old, we often played music not just to lull him to sleep but to soothe and calm him. My husband plays the guitar and is one big music lover. I wasn’t big on playing Mozart or Beethoven while I was pregnant. I just wanted anything with a feel-good rhythm and melody. So my baby was exposed to all types of songs – pop, old school R&B, mellow and some EDM. So imagine my surprise when one time, I played a series of music videos and there he was – my tot who can barely stand but swaying rhythmically with his hands up in the air. 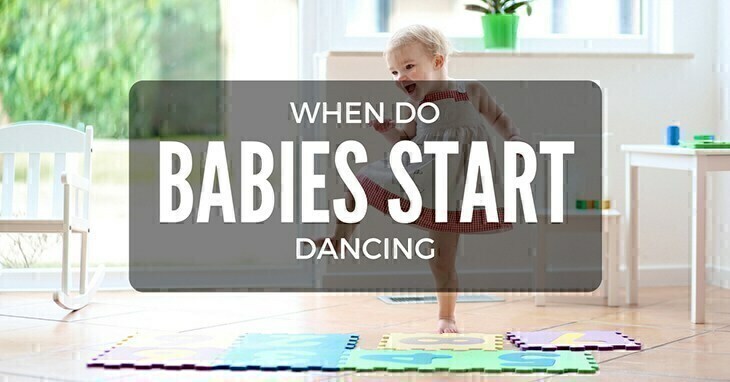 I’m sure you’ve asked yourself, when do babies start dancing? Is there an exact age? Right now, you should also visit a few posts about milestone in the development of children as: when do kids learn letters? or w﻿﻿hen do babies start talking clearly﻿? Or do you need to play something pleasant to help them? If you ask me, I couldn’t pinpoint the exact month my son started jiggling and wiggling. It’s like he was learning on his own. There’s a study conducted on how babies respond to the rhythm and tempo of the music, how they act when they hear a beat or two. And the result was that they find listening to music more engaging than people talking. 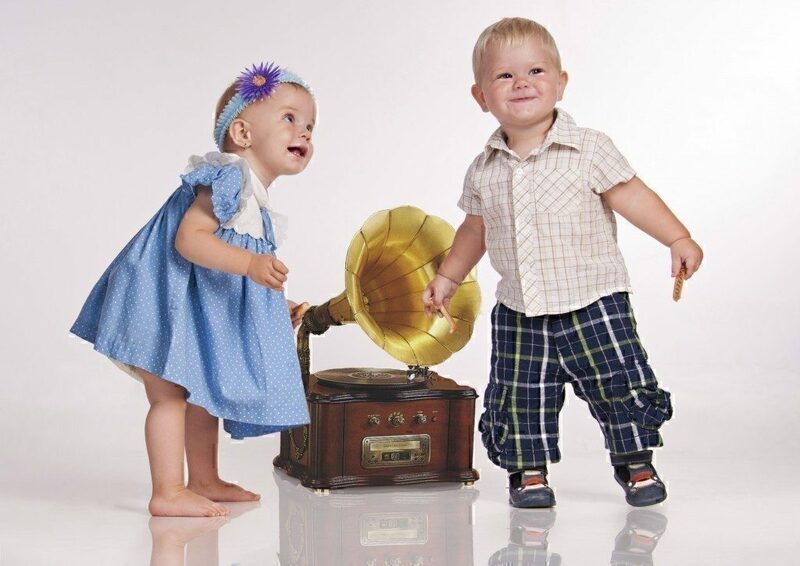 We know the benefits of tal﻿﻿king to your tots and how it helps them develop their communication skills too BUT babies were ‘born to dance.’ Yes, it’s innate to them to move with the music. In fact, children as young as 8 ½ months old know when somebody’s dancing off beat. Ha! I think my son has been secretly judging my dancing skills all this time, and that’s maybe why he’d laugh when I’m trying to pull off ridiculous moves. All the while I thought he was enjoying it because I dance well. Maybe he’s already thinking, “My mom is embarrassing. No one else should see this.” LOL. And another thing, you know when people say dancing relieves stress and could make you happier? Well, the same thing goes for babies. It makes them smile more. I guess music does that to all of us – it transcends age. It’s a universal language even infants understand. Being attuned to music comes naturally to babies. Notice when they hear songs, they’re likely to clap their hands, sway or wiggle their arms. But the moment they start to walk, they’ll be unstoppable. My little boy was about 11 months when he could stand without assistance and would even start stomping his foot and laugh while listening to pop tracks. BUT, they first need to have enough control over their body which is why they often start dancing at around 14 months or that time when they begin exploring your house. Their moves are predictable – they will start off with their feet firmly planted on the floor then bob up and down. Yep, that’s how my little boy did it. And he waves his hands to the beat. By 17-18 months, they’ll begin experimenting with other dance moves like turning around or swaying from side to side. It helps their creativity and development. It’s also a good way of expressing themselves, and it even helps improve their sense of coordination. And since they love dancing partners, you should sign up to be the first! Most toddlers are already good at creating new dance moves though. I mean, I don’t know if you’ve seen the Late Late Show episode which aired last February 24. Host Jame﻿﻿﻿﻿s Corden and actress-dancer Jenna Dewan-Tatum participated in a toddler-instructed dance class and boy was it fun! It’s more challenging than you think and by the end of the routine, they were sweating profusely. Now, who needs to enroll in aerobics or sign up at a gym session when you can just put in a funky tune and follow your tot’s moves! It’s a good option for kids who are 2-3 years old. Don’t worry about it being too rigid because most of the time, they’d just do pre-dance movements which are a lot like the Late Late Show episode – letting your toddlers do their thing on the dance floor. It’s also a great way for them to socialize and stay active. Some dance schools even offer a free trial so you can gauge whether it can be beneficial to your kid and also for you to get a feel of their environment. Be prepared though because there are lessons which may require you to participate. So better keep those dancing shoes ready! Dancing can boost your wee one’s confidence which is why there are things you can do to encourage them to bust those moves especially if you’re not buying the idea of enrolling them in dancing classes. Use spare area as the dancing room: They LOVE to go all over the place and are likely to bump into tables. Clearing a space for them for the sole purpose of dancing would be great, and it will give you peace of mind as well. You can even place a large mirror in front to mimic the look of dance classrooms. Always give them positive feedback: This is a huge deal because every child responds well to positive feedback and will likely perform better once he/she knows you like what you’re seeing. And please, avoid negative comments as much as possible. Let them pick their music: By this time, they like to try out different genres, and it’s always a good idea to mix up songs so they won’t easily get bored of hearing the same thing over and over again. Go for something cheerful, upbeat and fun. Children learn so much through movement and dancing is a great avenue for them to let steam off too. Music is beneficial with regards to physical, emotional, and cognitive development. But of course, like everything else, it should be an enjoyable time. I am not a good dancer, but when it’s just my little boy and me, we dance like nobody's watching. And let me tell you, we end up sweating but laughing hard, and that’s all that matters.